"For years, the Eastman Kodak Company had worked to develop a system of movie equipment and film that would be easy enough for the advanced amateur photographer to use, yet reasonably affordable. 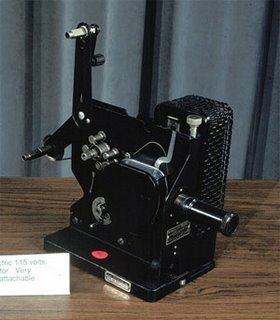 The result was the Sixteen Millimeter "Cine Kodak" Camera and the Kodascope Projector". The camera itself weighed about seven pounds, and had to be handcranked at two turns per second during filming. A tripod was included in the package, all of which cost a whopping $335.00! And this in a time when a new Ford automobile could be purchased for $550.00." 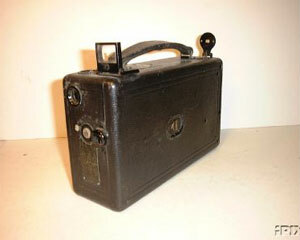 In 1932, Kodak introduced a new format, Cine Kodak Eight, which made home movie-making more accessible. Here are some photos of what Walter's camera and projector probably looked like. Actually, I can check, since the actual projector is over at Joanne's house. On the other hand, the camera did not turn up in the stash, so we will have to guess which model Walter owned. Shared military service was the only way to "yank the hyphen" out of Italian-Americans or Polish Americans or other imperfectly assimilated immigrants. "The military tent where they all sleep side by side," Theodore Roosevelt preached, "will rank next to the public school among the great agents of democratization." Compulsory military training, said a Representatiove in 1917, "is a melting pot which will ... break down distinctions of race and class and mold us into a new nation and bhring forth the new Americans"
More later if the book has anything specific to the Rabinowitz and Ratner men as the country prepared for war.